This trip was scheduled originally for October 27, however, the weather did not co-operate. We have a date open on November 17, so we are going to try again! At the end of the last Ice Age, the glaciers receded back to the north. Freed from the massive weight of the ice, the earth cracked and rebounded creating the Niagara Escarpment. This radically changed the way water flowed from the continent and created the Great Lakes as we know them today. The Niagara River was the only point where lake water flowed over the Escarpment and the Falls were born at the site now known as Queenston. In the thousands of years since, the falls have carved their way back through the Escarpment to their present position. Today we will be hiking where the Falls were 9000 years ago. On this hike you will see some amazing examples of nature's forces at work. Huge gaping potholes carved in granite by small pebbles driven by the incessant flow of the river. Enormous boulders left by the river as it changed course. Dramatic textures carved into rockfaces over thousands of years. Not to mention the river rapids and the sheer enormity of the gorge itself. Probably, it will be too late for fall colours, but with the leaves gone, there should be some very nice views of the cliffs and the river. There is something wonderfully primeval about this place that speaks of a time before humankind; like some lost valley in the Himalayas. There are fossils everywhere down here, Trilobites, Scorpions and Sea Lilies. Keep your eyes open. This is a scenic hike, not a marathon. Stop and smell the mosses. These notes are by Rolf Berger. The GPS track is courtesy of Duke Ducyk, from 2010Oct02. Go north to Highway 401. Drive west on the 401 to Highway 427. Drive south on 427 to QEW Hamilton. Follow the signs for QEW to Niagara Falls, and cross the Burlington Skyway. Continue on the QEW to Niagara. Shortly after you cross the St. Catherines Skyway over the Welland canal, the highway will fork. Keep to the left and follow Highway 405 to Queenston/Bridge to the USA. Six kilometres later, on the right, exit the 405 at Stanley Avenue. Do not miss the Stanley Avenue exit! The next exit is the USA! At the end of the ramp, turn left on Stanley and go across the bridge. Turn right at the stop sign on the other side of the bridge. 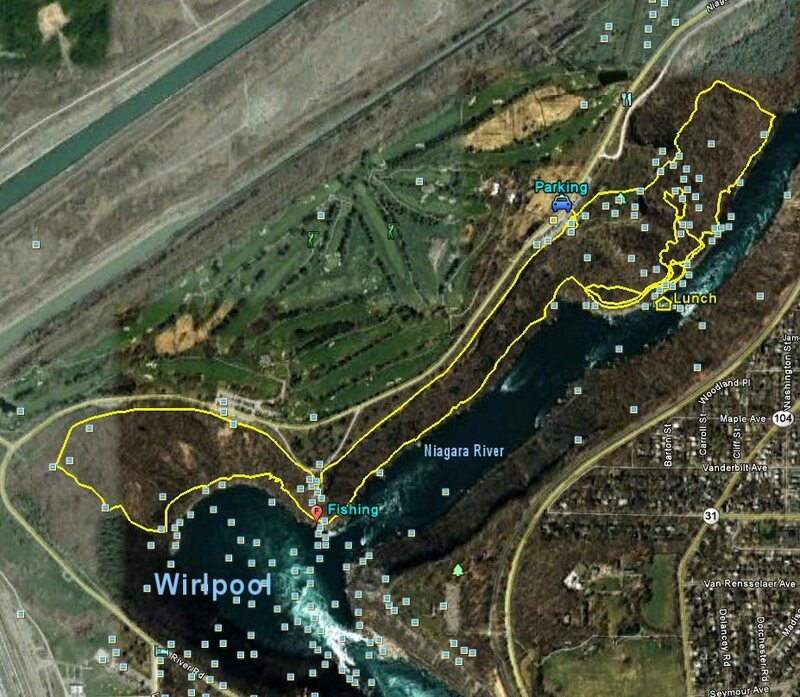 Follow Portage Road 3 kilometers to the Niagara Parkway. Turn right at the Parkway and head towards the Falls. You will pass the Floral Clock and the Adam Beck Generating Station. As you are passing the School of Horticulture (on your right) look for the Niagara Glen Nature Reserve parking lot which widens the road a bit further to your left. You should also notice signs for a Gift Store and/or Niagara Gorge trails. The hike starts at 12:00 noon. 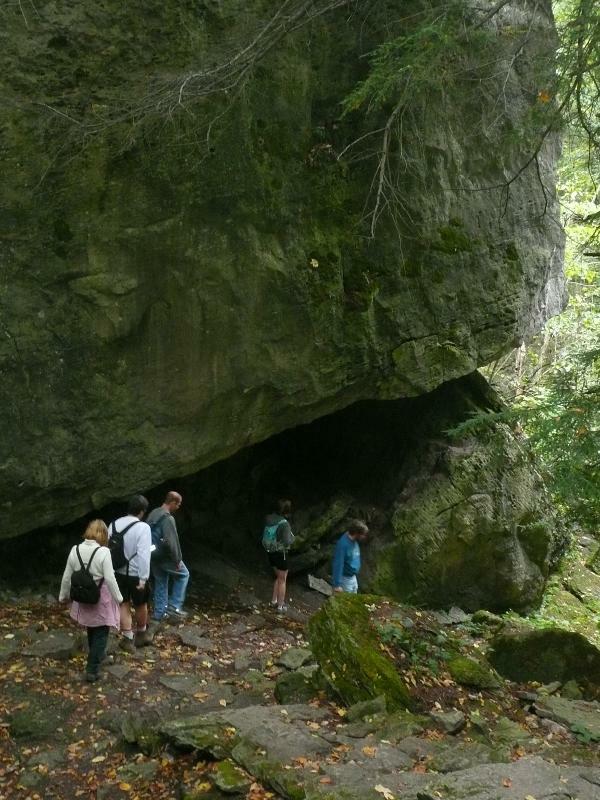 This is a fairly difficult hike with slippery rocks and a lot of ups and downs. Hiking boots are strongly recommended. The distance is fairly short and the speed will be moderate. 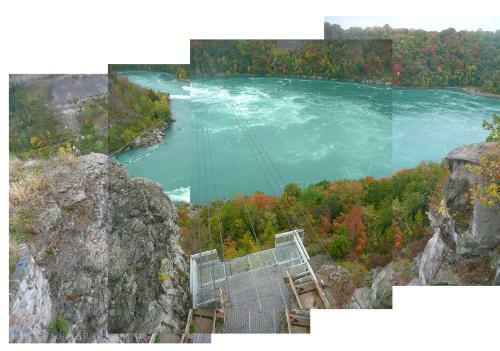 The composite photograph below is the whirlpool from on top of one end of the cable car. We are trying something a little different this time. After the hike, at approximately 4:00 p.m., for those of you interested, you have the opportunity to visit the Ice House Winery, RR#1 Niagara on the Lake on the way into Niagara-on-the-Lake. for dinner. Ice House Winery offers a full flight of 3 Northern Ice award winning Icewines and a N'Ice Wine Slushie plus some small food pairings and a lesson on the art of blending Icewine for cocktails at a cost of $10 per person. For those of you who have not yet experienced the joy of ice wine, it will be a taste treat! You may be so impressed, you'll walk out with a bottle (or two). You can partake in wine tasting as you prefer or go for the Slushie. You may want to designate a driver for this visit. For more details, check out the Ice Wine winery at http://www.theicehouse.ca. This is on the road from Niagara Gorge to Niagara on the Lake, so it will be convenient. For those of you who wish to head back straight home, we will miss you (maybe next time) or some may wish to head straight into NOTL to wander around and/or go for dinner at the Olde Angel Inn in the downtown. Those of us heading to the winery can head to dinner afterwards.